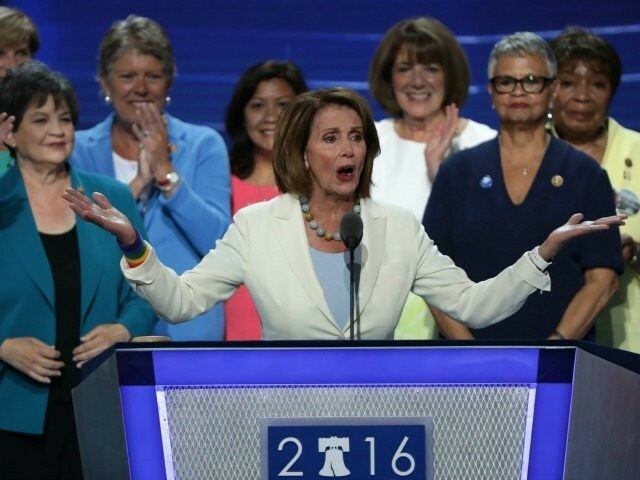 The woman leading Democrats in the House addressed delegates at the Democratic National Convention in Philadelphia Tuesday minutes after they voted by acclamation to nominate Hillary Clinton their candidate for president of the United States. The congresswoman dodged and deflected pressure to endorse Clinton during the primaries, but she finally did so the day of the June 7 California primary. Pelosi was joined on stage by other female members of the House, who also came to voice their support after Leader Pelosi. The 20-minute program with Pelosi and her sister congresswomen was consistent with other elements of the night, but stood in contrast with comments made to Politico’s Glenn Thrush on his “Off Message” podcast. In the podcast episode released Tuesday, Pelosi told Thrush that although she believes Republicans have spent tens of millions of dollars to demonize her because she is a woman, she thinks Clinton should dial back the female identify politics. “I don’t think that any woman should be asked to vote for someone because she’s a woman, and that — because the candidate is a woman,” the former speaker told Thrush. Nothing is more important for American than having more women participating and taking leading roles in government and politics, she said. “The Democratic women of the House are leading the way to unleash the power of America’s women and working families in our economy, our society and our Democracy,” she said.